Did the people of the past know how to fence? Looking at a period between 1350 and 1750, which includes the majority of arts of interest to HEMA, the answer varies because of the large amount of time covered. Focusing on the 17th century and the rise of the rapier, the masters themselves give an answer- at first most people did not know how to use a sword even if they owned one. However, by the end of the 17th century things had improved so much so, that one master claimed that people were reaching the apogee and perfection of fencing! The clear disdain of most people’s ability to fence in the early 17th century dispels the myth that because everyone’s lives could be at risk, and people were generally more armed than they were not, that therefore they were well-versed in the use of the weapons that they carried. While it is common sense, it is contradicted by the historical record, with Giganti and Swetnam both explicitly noting that people did not know how to use the weapons they had swinging in sheathes at their sides. What is bad fencing though? This is a trickier question because at times, masters discuss how unskilled most people were, other times they reference common techniques that were clearly trained, yet in their view bad, or perhaps a better word is, inefficient. Then the issue arises that the masters contradict one another. What was good fencing against an experienced fencer for Giganti, was mortally foolish according to Fabris. While Giganti says most had no idea how to fence, Fabris implies that they do, he just knows a better way. The following masters give their insights, both on the state of fencing as a whole, as well as what they saw as bad techniques. Docciolini was a Florentine whose fencing was developed in the 16th century, at the end of a fifty-year long career he wrote down his methodology in 1601. His dedication gives some insight into the state of affairs of fencing at the time. He is almost apologetic, noting that while fencing was not the first thing of importance in the military arts, it was still important. An issue that may have led to the decline of fencing the 16th and 17th century was the gun. Cities in the 16th century swapped out their swords and poelarms for guns. The popular fencing guilds saw attendance drop in favor of shooting clubs. The 16th century masters such as Mair and Meyer lamented a waning interest in swordplay. Docciolini, echoes this. On a motion called a sfalasta (disengage), he notes it is a common technique of the inexperienced fencer. Later masters would somewhat disagree, noting that the disengage could be used as a feint, or might be necessary if the sword was gained by the opponent. However, from Docciolini’s perspective, it was a common maneuver performed by inexperienced fencers. He hedges his bets later saying he is not against feints, but prefers them done a certain way. His opinions are contradicted by other masters, such as Gigant and Fabris. This makes knowing what is a ‘bad’ fencer and a ‘good’ fencer more difficult to understand. Still, taking Docciolini at his word, a great many fencers were inexperienced and fought in an unsafe manner. 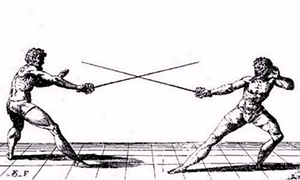 Giganti was an early 17th century fencing master who wrote two books, the first covering the basics of rapier fencing, the second is more insightful to the question at hand because it covers subjects outside the salle. When describing the salle, Giganti appears to indicate that steady practice is needed and that many will ignore all of his teachings and try to use relentless attacks to unsettle the better fencers. The implication is that even in a training school, not everyone was particularly a good fencer. Giganti’s second book looks at things outside the salle and the use of the sword single-handed and with the dagger. 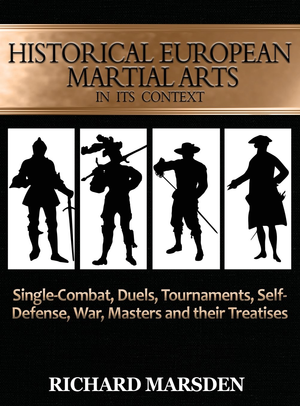 It covers topics that might be found in a more self-defense situation and in this he is more explicit about the state of general swordsmanship in the early 17th century. Giganti specifically mentions that most do not know how to use the sword, yet they are dangerous. The indication here is that although many men were armed with rapiers, they did not use them correctly and instead of thrusting performed cuts and that this was quite common. Giganti does not dismiss these men as easy to contend with, but rather unsafe to fence. When it comes to a series of four grappling techniques, Giganti warns his readers that they are not to be done by someone with little experience, which again, he noted was most people. When discussing the cape, Giganti again warns his readers about most other fencers. Fabris and others have a different reason, noting that the dagger and other possible to hide weapons were banned in parts of Italy by various rulers. Giganti is quite clear in his opinion that, not only did most people fence badly, they often knew nothing of swordplay at all. He is also quite clear that this lack of knowledge did not make them easy to defeat, quite the contrary. Bad fencers, in his view, were entirely dangerous, both to their opponents and themselves. Fabris was a much celebrated fencer who wrote his treatise in 1606, and for many decades later was copied, praised and referred to by other masters. His treatise on the rapier and some of its complementary weapons, such as the dagger and cape, is incredibly thorough. Fabris thought that most fenced in an inefficient manner, not necessarily that people did not know what they were doing. This differs from Giganti, who points out people did not know how to fence at all. When discussing guards, he depicts the standard four guards of the rapier, prima (first), secunde (second), terza (third) and quarta (four). He explains and illustrates them, and then proceeds to show how by using his low and bent body position, the guards were improved upon. Fabris also lists guards that he thinks are so bad that he apologizes for mentioning them including, keeping the point low to the ground, or the sword wide and to the side, or using the off-hand to fortify the blade for a beat. Here, other masters disagree, but Fabris saw it as poor fencing. Example of the posture and guards from Giganti. Fabris describes four types of cuts and which are superior and which are not. In all of these cases he does not say how common it is for people to use the inferior guards or cuts, but we can assume that enough were using them to entice him to write about them. Fabris says that many people use their left hand to grab or bat away a sword. He was not entirely pleased and saw this as bad fencing. Of feints, as with cuts, Fabris presents inferior methods that are for the inexperienced, including, stomping the foot, jabbing the sword one way and then the other without presenting a threat and so forth. As with his description of inferior cuts and guards, it can be surmised that he spends so much time on bad techniques because they were commonly done. Indeed, all of Fabris’ prior teachings are the commonplace, and his second books discusses something unique, the aggressive move towards the opponent without waiting for a tempo called, proceeding with resolution. Here it can be hard to determine if Fabris saw all prior fencing as poor, or perhaps just common. He says that it was important to learn how to wait for a proper tempo and learn the defenses against an attack, but that once mastered, his proceeding with resolution would lead to a superior form of fencing. When furthering his point, he calls out other theories. Of those who get within measure and try to provoke a response, either by feints or invitations, such as seen in Giganti. Fabris is not thrilled by this. Is this bad fencing though? Giganti says the exact opposite, that when faced against a skilled opponent, feints and deceits are vital. We are once again posed with the problem of, did people not know how to fence, as Giganti is explicit about, or did they have differing ideas, some of which were bad, which Fabris alludes to? Fabris helps answer the question when he tells his reader who his audience is. Fabris says he will only write in passing about weapons other than the rapier and dagger because his art is for honorable gentleman with matched weapons and that the ramparts are far away from his writing, as are the common masses. Giganti, on the other hand, discusses what to do when jumped at night by three men, or getting in an argument with someone and having to draw daggers in the heat of the moment, or facing an armored opponent when you are not! Giganti’s audience is much broader, and indeed, perhaps the majority of people did not know a thing about swordsmanship in his world, while Fabris, with a much more elite and smaller clientele, was more interested in correcting inferior, but serviceable methods. Joseph Swetnam was an English Master of Defense who thought the Italian methods were dangerous. Yet, he said it was necessary to learn to use their weapons. He wrote in 1617, by which point the Italian rapier was becoming the weapon of choice for people, even in far away rainy England. Swetnam explains what had happened to the traditional weapons of the isle and why Englishmen had to learn to use the rapier. And that people were not practicing with the Italian weapons leading to problems. From Swetnam’s point of view, not only did people not know how to fence, those that learned were often getting bad advice from Italians. Swetnam was sure that he could take the devilish weapon and make better use of it. While some men trained, Swetnam found this could create not better fencers, but worse, and that many waited too long to learn to fence, and regretted it later when in a duel. Swetnam spends a good bit of his writing noting how men who saw fencing or practiced it occasionally, when called upon to use it, could not successfully mimic what they saw, nor remember what they lightly practiced. This, he saw as a common problem in the populace. Soldiers were no better, having put aside what he saw as decent weapons and instead taking up new ones, and yet not knowing how to use them. Swetnam’s audience was similar to that of Giganti and dealt not just with honorable gentleman, but the masses. Swetnam in particular goes at length to discuss how to be cautious when drinking, fighting and dealing with cowards and murderers- hardly the same crowd Fabris rubbed elbows with. Giganti and Swetnam indicate a general lack of knowledge of swordsmanship in the general populace. At the start of the 17th century the rapier was a new weapon, whose use was spreading quickly, leading to a variety of masters with differing ideas on how best to use it. People as a whole, if Docciolini, Giganti and Swetnam are to be believed, had no skill at all- but were still dangerous to themselves and others. The elite, to whom Fabris directed his works, were trained, but he felt inefficiently. He describes not so much the sad state of affairs in fencing, but how his way, though controversial, was better than what was commonly taught. The state of fencing had much changed by the mid 17th century, with Bruchius and L'Ange, not saying much of poor fencing. L'Ange went as far as to hold back techniques, that were deadly, so as to prevent them from becoming common knowledge. And by the 18th century, perhaps a level of arrogance had descended on the masters, who like Wylde, indicated that fencing was quickly reaching its zenith. Arrogant or not, one gets the sense that in 1600, few knew how to fence at all, but by 1700, it was commonly practiced.